My cousin Alyssa graduated from high school in June and my aunt threw her a graduation party on Sunday. Guess who got nominated to bake? Yeah – this girl! Since my aunt was already ordering a huge Cassata cake from a local bakery, I decided to go the chocolate route and make my crowd pleasing Reese’s Peanut Butter Cup Cupcakes and some chocolate chip cookies. 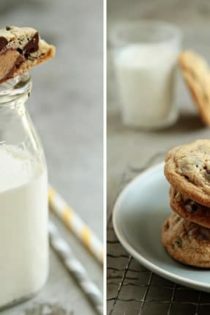 These aren’t just any chocolate chip cookies though – they’re loaded with big chunks of dark chocolate and have a miniature Reese’s Cup stuffed into each center. It’s a little pop of peanut butter that kept people coming back for more – in fact they were the first item to disappear from the dessert table. Yay me! I took a little inspiration from my Rolo Cookies and simply replaced the Rolos with Reese’s Cups. The beauty of this recipe is that you can really stuff just about any type of miniature candy bar into the center. Think Snickers, Milky Ways, or even Dove Promises – the possibilities are endless! So whether you’re baking for a party or to simply satisfy a craving, I think these Reese Cup Chocolate Chip Cookies are a total win – you can thank me later! 1. Heat oven to 350°F. In large bowl, beat butter, sugars, vanilla and eggs with electric mixer on medium speed or with spoon until light and fluffy. Mix in flour, baking soda and salt. Stir in chocolate chips. 2. Measure dough using a little more than a medium cookie scoop (about 2 tablespoons). Roll into a ball and then flatten in the palm of your hands. 3. Place a frozen miniature Reese's Cup in the centers of the flattened dough balls and form dough back into a ball around the miniature Reese's Cup. 4. Place miniature Reese's Cup stuffed dough balls into the freezer for 15-20 minutes before baking. 5. On cookie sheet lined with parchment paper, place dough balls 3 inches apart. 6. Bake 17 to 20 minutes or until the edges are golden brown (centers will be soft). Cool on pan for at least 3 minutes; remove from cookie sheet to cooling rack. 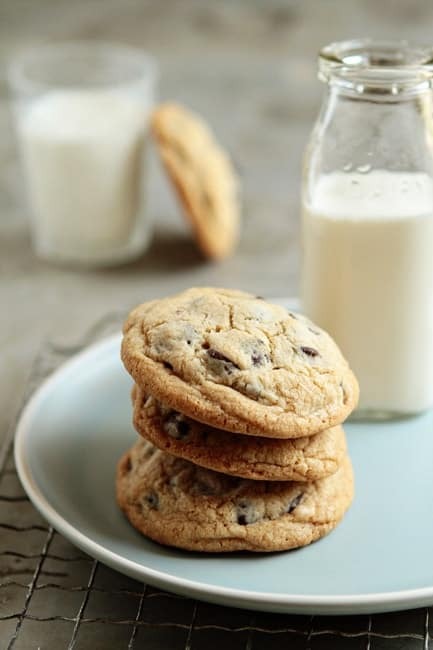 - Store cooled cookies in an airtight container for up to 2 days. Loving it! :) Looks awesome! Yes, please and thank you. YUM! My boyfriend loves PB cups. If I come home form TJ’s without the package of mini ones I definitely hear about it, so I’m sure he would love these cookies! Sounds great! I love Reese’s Chocolate and this just takes it to another level! I love me a regular CCC, but stuffed with a reese’s is even better!! One word: Yummy ! ! Perhaps this is the perfect cookie? YUM. These look seriously fabulous, seriously chewy, seriously delicious. Seriously. Love these! 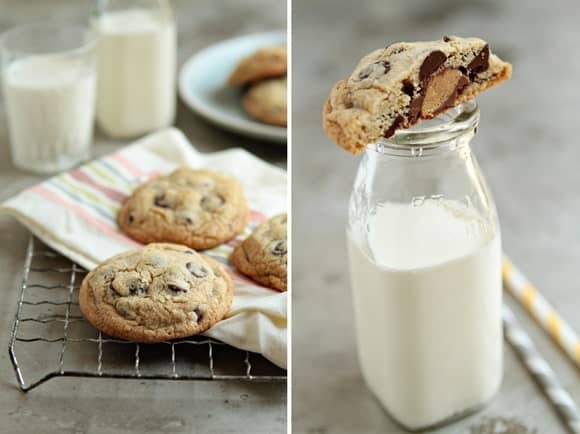 Reese’s PB cups in chocolate chip cookies?! Amazing! This looks like the PERFECT treat! These look amazing! I love anything with peanut butter–especially when it has chocolate. Also a big fan of putting stuff inside of cookies. Yum! LOL…that doesn’t happen often now does it ;D. Great cookies thought for a graduation party, bet she loved them and the fact that you made them for her. I love how these have a hidden peanut butter cup in the middle! Surprises are nice sometimes :) I will be making these soon! I have a husband who would be out of his mind for these cookies! Stupid question. But I’m guessing these are the baking size mini cups? OR are these the regular miniature cups, the size down from regular? Yes, definitely use the ones labeled Miniature – not the ones that are super mini like baking chips. Hope this helps! I actually didn’t read this response until now, and already bought the mini baking ones… so I’m out of time to run to the grocery store… however.. I think I’ll just mix in the reese’s baking chips with the dark chocolate chips and still get that peanut buttery goodness! Will do it the “right” way next time. THANKS AGAIN! This cookie is insane!! Love it! These look delicious! I have been trying to find new things to bake with Reese’s because everybody loves them and these I will have to try! Oh how I love peanut butter. And you know I think this particular recipe is cookie perfection anyway. Add peanut butter, and I might just die and go on a cookie bender. Can I make these and then freeze them until I’m ready to bake them? Or do you HAVE to bake after 15 minutes of freezing? You can try to freeze this recipe for a longer period of time; however, since I have not attempted with this recipe, I cannot tell you how long they need to remain out of the freezer before baking. If you try this, stop back and let us know how it turned out – good luck and have a great day! You can adjust the amount of chocolate chips to the amount that works for you.